Summary: In her debut novel crackling with humor, heart, and an unforgettable cast of characters, Miriam Parker follows one woman’s journey from Iowa to New York City to California wine country, to figure out what being true to oneself really means. Abandoning your dream job and life shouldn’t feel this good. But for Hannah, it is an eye-opening experience; and she realizes that maybe, after all her dream-chasing, she hasn’t actually been caring for herself. And this new life certainly seems like a dream come true–living in a picturesque cottage overlooking a vineyard in lush Sonoma; new friends with pasts and hopes the likes of which she’s never encountered before; and William, the handsome son of the winery owners and an aspiring film director who captures Hannah’s heart only to leave for the very city she let go. I rarely review (or even read for that matter!) books months before their publication date; however, I had to read THE SHORTEST WAY HOME by Miriam Parker. This novel won't be available until August 2018, but I wanted to share my thoughts with everyone now! I read THE SHORTEST WAY HOME over the Christmas holidays (I actually saved it a few weeks so I'd have a special present! ), and I absolutely treasured each and every page. This novel is delightful! I should probably give you a little background on why I am so excited about this book. The author, Miriam Parker, was the first person who ever sent me a book to review on my blog... so needless to say, she holds a near and dear place in my heart. Throughout the past ten years, I've met with Miriam almost yearly (along with Kathy aka Bermudaonion) and we've talked books and life in general. I am so excited that she is realizing her dream of being a published author! When Miriam announced that her book was being published by Dutton, I also learned that her editor was Maya Ziv. I also love Maya and many of the books she's edited over the past few years. (Small world because I really don't personally know many editors!) I guess what I'm trying to say is that I knew THE SHORTEST WAY HOME was going to be a treat because this duo is special -- so smart and so talented! Before you judge me and think that I might be a bit biased about THE SHORTEST WAY HOME, I swear I had real concerns that I wouldn't love it. (And then what, right?) However, I shouldn't have worried, this novel was entertaining and had terrific characters. It was both funny and touching... and even better, it made me think. All in all, I'd say that it was exactly what I want from a book! 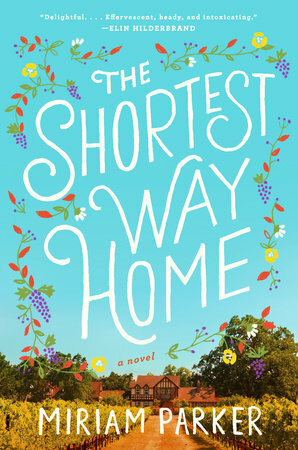 THE SHORTEST WAY HOME is in many ways a coming-of-age story, albeit the character is a woman who has just finished grad school and already has an amazing job in Manhattan. Hannah is finally living her dream... or at least what she thinks her dream should be. She has a great fiancé, a cool apartment, and a high-powered job that is the envy of her friends. But before she moves from California to New York, she and her boyfriend decide to take a quick vacation to Sonoma. And that's when Hannah's life takes a drastic (and unexpected) turn. When Hannah visits a small winery, she immediately feels at home. The owners (and their very handsome son) have been running this family-owned business; and while they make amazing wine, they are struggling financially. It's apparent that they could use some help, and Hannah has some ideas that just might bring in more business. She can't explain why, but Hannah wants to work there for the summer... and that means turning down her job, giving up her apartment, and even staying behind without her fiancé. As unstable as her childhood was, Hannah, for the first time in her life, feels like she belongs. As Hannah becomes more involved with the business of the winery, she also becomes more involved with the family who owns it (and especially the handsome son.) She loves her new cottage, her job and her new friends; and she is forced to question whether her life-long desire to live a past-paced, high-powered life in Manhattan is truly what will make her happy. THE SHORTEST WAY HOME is such a terrific novel, and it definitely lived up to my expectations (and then some!) I loved that this novel was entertaining without being entirely predictable, and that it was so smart. The characters were complex and the story was very well written. But best of all, this novel was about life, love, and self-worth -- things that will resonate with all readers! One of the reasons that I enjoyed this novel so much was that I immediately felt an affinity with Hannah. While I'm much older than Hannah, I could relate to her insecurities as well as her desire to prove her success (as well as her love of books); and I think most female readers will feel the same way. Fortunately for Hannah, she realized earlier on than I did that it's not necessarily the job or the apartment or even the money that brings happiness. It's being true to yourself! Another aspect of this novel that was so much fun was the setting. The novel takes place in wine country, and I do love wine! I haven't made it to Sonoma yet (it's on my bucket list), and this novel made me even more desperate to visit. Miriam's descriptions of the wineries and vineyards, not to mention the deliciousness of the various wines, were sheer perfection. Just a warning for when you read this novel (and you seriously need to pre-order it now! ), you might want to have a glass of your favorite vino ready! I honestly am so excited for my friend and my fellow book lovers because THE SHORTEST WAY HOME is as special as a great glass of wine! Highly recommended!